This is the second in a series of posts to walk through what was launched / delivered. It has been two years since we introduced the RecoverPoint splitter within VPLEX. The awesomeness of VPLEX was joined with the coolness of RecoverPoint. With this combination, we delivered operational and disaster recovery to VPLEX customers to add to the continuous availability that they already had access to. These were extremely complementary use-cases. While there were a lot of skeptics outside of EMC about this combination, we were quietly confident in our belief that customer wanted an extended continuum between disaster recovery and continuous availability. Suffice it to say, that this combination has exceeded our revenue expectations. Since the launch in May 2012, the organizations have come even closer together within a single business unit further solidifying the bonds between the two teams. 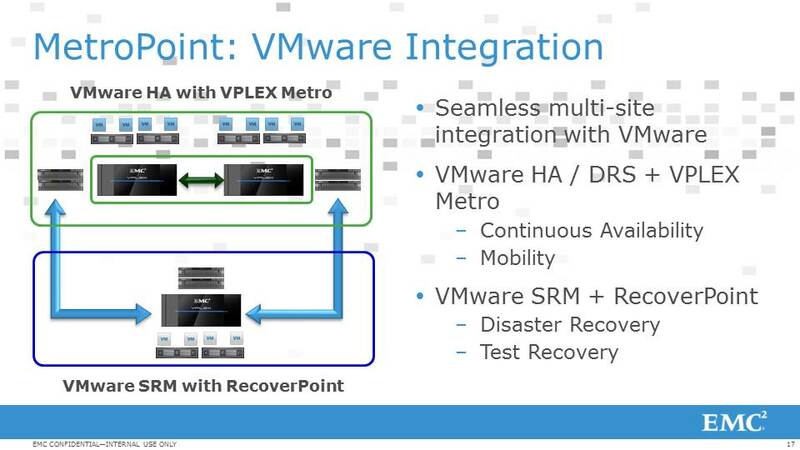 A quick recap of the current integration points between VPLEX and RecoverPoint. RecoverPoint delivers continuous data protection enabling local and/or remote protection. This is enabled by a RecoverPoint splitter which resides within the VPLEX platform. 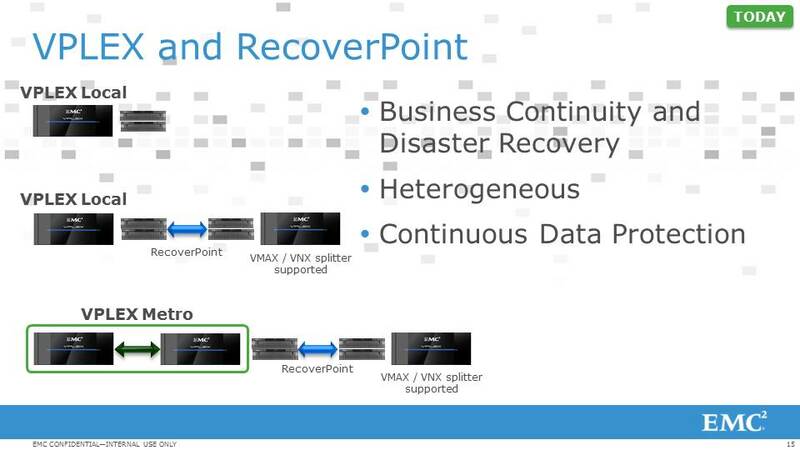 RecoverPoint has a similar splitter in the VMAX and VNX platform as well. The RP splitter enables WRITES to be sent to a RecoverPoint Appliance (RPA). From there, you can enable local protection (where the writes are journaled locally) or remote protection (where the writes are journaled remotely) or both. The beauty of RecoverPoint is that it can store every single write to give recovery a DVR like capability. The other benefit of RecoverPoint is that the protection is heterogeneous i.e. it can protect between every combination of VPLEX / VMAX and VNX. The slide below shows the currently supported topologies. Customer topologies are all over the map – we see a lot of traction with the VPLEX Local and RecoverPoint Remote Protection (as we expected). However, the second largest topology is the three sided cascaded topology. And that was a surprise. Upon digging further, a lot of customers have business requirements that need them to have out-of-region disaster recovery site. Yet other customers are deploying VPLEX Metro within one site. So, the usage of RecoverPoint in this case is to provide DR to a Metro deployed within the site. This is the cascaded topology. As you can imagine, the downside of the cascaded topology is that if the replicating VPLEX Cluster fails or loses connectivity, DR protection is lost. 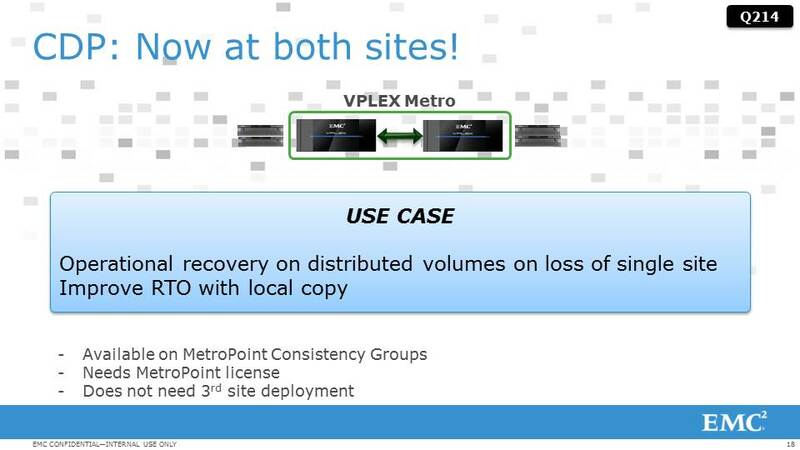 Since the launch of RecoverPoint on VPLEX quite a few customers have been asking us to add the capability to protect both sides of a VPLEX Metro to a common third site using RecoverPoint. Well, that is exactly what we have done. The MetroPoint solution launched April 4th will GA at the end of Q2. This is a joint capability between RecoverPoint and VPLEX. Starting with RecoverPoint 4.1 and GeoSynchrony 5.4, customers will now be able to add Disaster Recovery and Operational Recovery protection to both sides of a distributed volume. 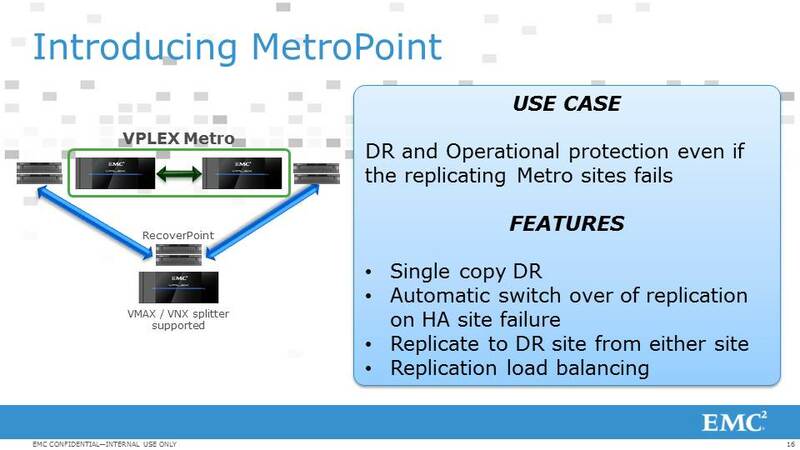 With MetroPoint, we took the time to do this right – although the protection is on both sides of a distributed volume, only one of the sides is replicating data. The data goes to a single copy of a DR leg. In other words, no additional bandwidth or storage is needed to enable MetroPoint as compared to enabling a standard DR scenario. To enable this, we have created a new kind of consistency group called MetroPoint consistency groups. This enables replication on both sides of a distributed volume. Another characteristic of the MetroPoint consistency group is that you can load balance which site is the primary replication site. If there is a failure on the primary replication site, the replication will AUTOMATICALLY switch to the surviving site. In other words, there is no loss of DR protection even if you lose the primary replication site. 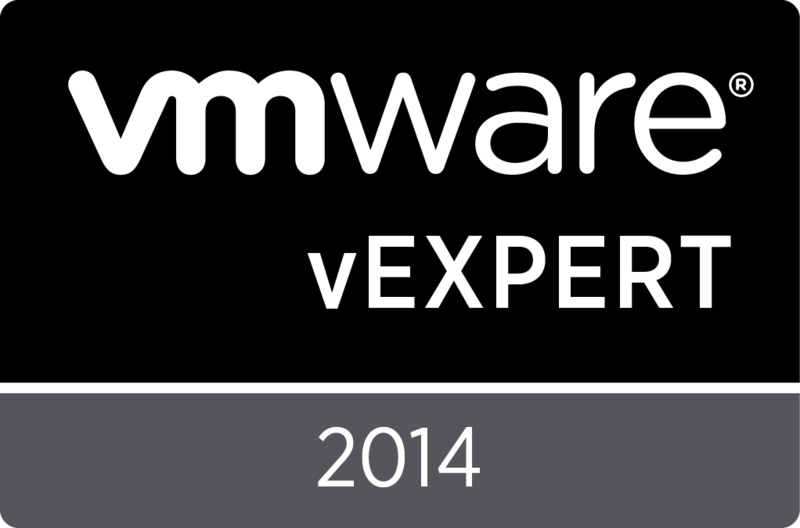 The VPLEX Metro sites are protected with VMware HA and the remote DR site is protected with VMware SRM. This now gives our customers simultaneous HA and DR.
One comment here: We talk about MetroPoint as a three site deployment and that is true. However, it is worth remembering that there are a number of customers who deploy VPLEX Metro within a data center either to protect multiple floors or multiple SANs or across a campus type environment. In those scenarios, customers can use MetroPoint to protect to a second site. There is a lot of interest in this deployment model. More coolness – along the way, we were able to meet one more request that our customers had requested. With the MetroPoint consistency group, we were able to provide operational recovery on both sides of a VPLEX Metro. And this does not need a third site!! To top this all off, MetroPoint is completely heterogeneous. All these goodies work with both EMC as well as non-EMC arrays. So long as the storage array is supported by VPLEX, you are good to go. With MetroPoint, we have raised the bar on continuous availability and disaster recovery. This has been the result of collaboration between the VPLEX and RecoverPoint engineering team with a lot of input from some of our lead customers. To all those who helped us get here, a very BIG thank you!